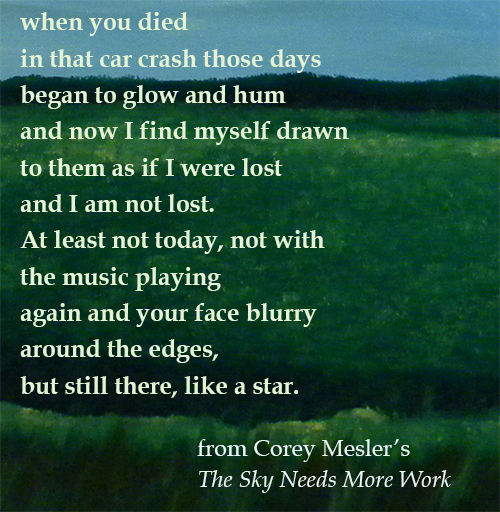 The Sky Needs More Work: poems by Corey Mesler, released 31 July 2014. 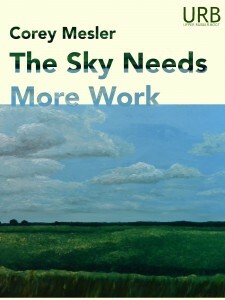 Corey Mesler’s The Sky Needs More Work will be featured on Difficult Listening – The Poetry Show at 107.1 and 103.7 FM and with simultaneous streaming via links on the website! ISBN 978-1-937794-72-9 (print) is available for order at bookstores which work with the distributor Ingram, and at Alibris (USA), Amazon (Canada; USA), Barnes & Noble (USA), Novel Depot (US, but accepts foreign orders), and Waterstones (UK). Signed/inscribed copies can be ordered from the author’s bookstore here. ISBN 978-1-937794-42-2 (epub) is available for iPad, Nook, etc. at Barnes & Noble (USA), Chapters Indigo (Canada), Kobo (USA), Novel Depot (USA), and Weightless (worldwide; US currency). ISBN 978-1-937794-40-8 (mobi) is available for Kindle on Amazon (AU, BR, CA, DE, ES, FR, IN, IT, JP, MX, UK, USA) and Weightless (worldwide; US currency). ground was hard and cold. Later she would be too. my ability to not be her husband. In “The Last Poem,” we are once again in dialogue with the same universal editor as in “Dear Editor,” and while the self-effacing tone still lingers, there is an element of hope in the newfound desire of the speaker to get his words, those turbulent ghosts, published. “The End of the Year of Darkness” sums it up best: “What is/lost is lost” and “What I create is good,” and what Mesler managed to create in these 88 pages is beyond good. —A.J. 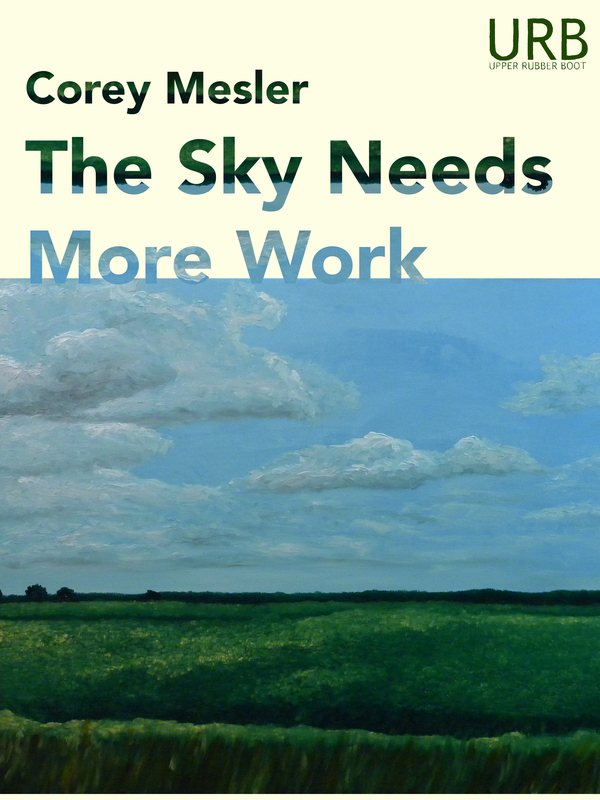 Huffman, “The Sky Needs More Work by Corey Mesler,” REviews, Summer 2014. If you are a lover of human experience, I highly recommend this book of poetry! —Sharra Rosichan, “Book Review: The Sky Needs More Work by Corey Mesler,” Odds and Ends, 27 August 2014. …the subject matter is dripping with delicious verbal concoctions… This book is not to be missed. Mesler’s is again a poetry manifesting, indeed, sustaining—the Memphis school. Wm. Carlos Williams and numerous others would find it substantial and elucidating of the all the contraries to the idealized lumpen life. The bottom falls away from it, the foundations, the bases, and one is put on notices to be aware of what lives live within the one we live. Merely by seeing in language. A poetry that does not need explaining, abjures it explicitly. Corey Mesler is that rarest of things: a truly fun, literary writer. Mesler repeatedly examines the flip-side of the coins laid over the eyes of pain and find laughter. Mesler’s poems bear a family resemblance to the excellent poetry of Kay Ryan and Tim Suermondt but chances are you have not read poems exactly like his. Inimitable, sometimes surreal or synthetic (joining the possible with the impossible), never illogical but willing to take brave leaps, his poems are as individual as he is, original, engaging, goofy, and smart as blazes. Not also but especially in the briefest, the tenderest of moments, when one is possessed by intimacy with his own life, there is no more crowding an enemy than human time. The radicality (I know, there’s no such word) of Corey Mesler’s poetry is its presentation of the terrific values in pieces of being, in protracted moments of verbal attention, in images that make even the awful and perilous things we know—enlightening. Corey Mesler has published in numerous journals and anthologies. He has published five novels, Talk: A Novel in Dialogue (2002), We Are Billion-Year-Old Carbon (2006), The Ballad of the Two Tom Moores (2010), Following Richard Brautigan (2010), and Gardner Remembers (2011), three full length poetry collections, Some Identity Problems (2008), Before the Great Troubling (2011), and The Sky Needs More Work, and three books of short stories, Listen: 29 Short Conversations (2009), Notes toward the Story and Other Stories (2011) and I’ll Give You Something to Cry About (2011). He has also published a dozen chapbooks of both poetry and prose. He has been nominated for the Pushcart Prize numerous times, and two of his poems have been chosen for Garrison Keillor’s Writer’s Almanac. With his wife, he runs Burke’s Book Store in Memphis TN, one of the country’s oldest (1875) and best independent bookstores. He can be found at coreymesler.wordpress.com. ISBN 978-1-937794-72-9 (print) is available for order at bookstores through the distributor Ingram, and at Amazon. Signed/inscribed copies can be ordered from the author’s bookstore here. ISBN 978-1-937794-42-2 (epub) is available for iPad, Nook, etc. at Barnes & Noble (USA), Chapters Indigo (Canada), Kobo (USA) and Weightless (worldwide; US currency). ISBN 978-1-937794-41-5 (pdf) is available at Smashwords. Kelly Link‘s Magic for Beginners was Flavorwire’s Book of the Week at the beginning of July. Chet Weise co-edited and appears in Language Lessons: Volume 1, released on Jack White’s Third Man, and including work from other Apocalypse Now alums Brian Barker, Pinckney Benedict, Nicky Beer, Andrew McFadyen Ketchum and Wayne Miller as well as two poems by URB editor Joanne Merriam. E. Lily Yu‘s “The Urashima Effect” was reviewed at Marooned Off Vesta. Berit Ellingsen‘s short story “Dancing on the Red Planet” is in the newly released The Apex Book of World SF 3. Her “Grains of Sand” appears in the winter edition of Blue Fifth Review. Simon Kewin‘s short story “Eighteen Million Butterflies” came out last month in Lakeside Circus. 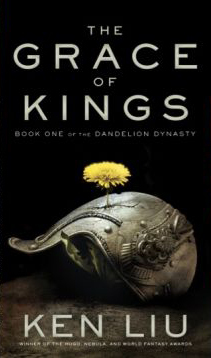 Simon & Schuster’s new science fiction and fantasy imprint, SAGA, debuts spring 2015 with some great books, including Ken Liu‘s first novel, The Grace of Kings. (Liu also has work in our spring 2015 anthology, How to Live on Other Planets: A Handbook for Aspiring Aliens.) Additionally: his translation of the first of the Chinese best-selling trilogy, Liu Cixin’s Three Body trilogy, The Three-Body Problem, will be released in November; and, his short story, “The Clockwork Soldier,” was reviewed by io9. Simon Sylvester‘s flash fiction piece, “Charlie Loved the Circus,” is up at The List, which also reviewed his The Visitors. Charles Trumbull has a piece about haiku in, unusually, Bulletin of the Atomic Scientists. Lyn Lifshin, whose persona poetry collection Marilyn Monroe: Poems we published back in December, has a new poetry collection out with Texas Review Press entitled Secretariat: The Red Freak, The Miracle. Speaking of reviews, Upper Rubber Boot titles are getting some great reader reviews! Bicycle Girl is not for the faint-hearted, as it includes some brutal scenes of interrogation, but this is a fascinating depiction of an all-too-credible future played out in a convincing (and refreshingly non-standard) setting. Best 99 cents I’ve spent in a long time. …It left me with the feeling that my brain had just been set afire (in a good way). This was a lovely, quick read with some powerful imagery! Announcing an open call for reprint submissions for our upcoming anthology of fiction and poetry, The Museum of All Things Awesome And That Go Boom, to be published in 2016 by Upper Rubber Boot Books. Editor Joanne Merriam is interested in explosions, adventure, derring-do, swashbuckling, dinosaurs, ray guns, von Neumann machines, fanged monsters, flame-throwing killer robots, chainsaws, antimatter, and blunt force trauma. She is also interested in writing which explodes our perspective of science fiction itself—literary fiction employing SF tropes, cyberpunk, speculative fiction, magical realism, infernokrusher, etc., are all welcome. Word/page count: Up to 10,000 words/story or up to 100 lines/poem. Payment: Pro-rated share of 30% royalty for ebook sales and 10% royalty of print book sales; pro-rata share to be based upon page count in the print edition. Publication history: Must be previously published, unless it’s a translation, in which case the original must have been published in its original language. Non-exclusive reprint rights must be available (but it’s fine if the work is still available to readers online). Unpublished works may be submitted by invitation only. Multiple submissions: Up to 3 stories or 5 poems. Simultaneous submissions: Since we will be asking for non-exclusive rights, this is fine as long as the other market is also non-exclusive; please note that this means we will expect you not to withdraw a submission because it has been accepted elsewhere. (c) a listing of previous publication credit(s) for the work. Put “Museum SF” in the subject line. If the work is a translation, please also provide a statement from the rightsholder that you are authorized to translate it.